It is no secret that social media is now playing a bigger role in wedding planning than ever before. Brides and grooms are heavy users of several platforms in all stages of their wedding planning. How are you using social media? The question is how are couples using social media and for what reasons. There are valuable insights coming from WeddingWire about the use of social media for wedding planning. 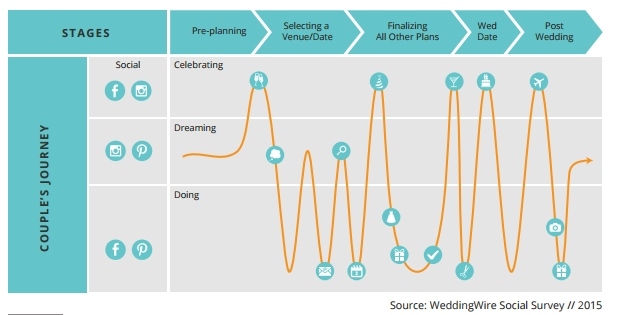 The typical wedding planning cycle begins around 13 months before the date. Most of the activity intensifies starting at 7 months before the wedding. Couples typically start their vendor research by searching for a Ceremony and Reception Venue, followed by Photographer, Caterer, Florist and DJ. There is one caveat to this planning chart. If you want the best vendors you will need to book them earlier rather than later. For example, this chart shows officiants being booked six months before the date. I am being booked 18 months ahead to ensure that I can make the couple’s planned date. Couples rely on certain social media sites during various stages of the planning process. When it comes to the ‘Dreaming stage’, 96% of couples use photo sharing platforms like Pinterest to find inspiration, whereas 54% use Facebook for this purpose. During the ‘Doing stage’ 89% of couples say they use Facebook to learn more about vendors they are considering for their wedding day. When couples are researching they are using social media for various purposes. It is found that on average, couples contact 25 vendors while searching for their team. Since venues are often seen as one of the biggest decisions during the planning process, approximately 30% of couples contact 10+ venues. Dress and Attire is no exception! When it comes to finding the perfect wedding dress, over 50% of brides visit between 2-5 shops and try on 3 – 10 dresses before saying “yes to the dress”. All this to say that brides and grooms are regularly using social media to maximize their time efficiency in selecting vendors. They are using multiple platforms to research, share and decide who will be part of their team for the day. How are you doing on your planning?